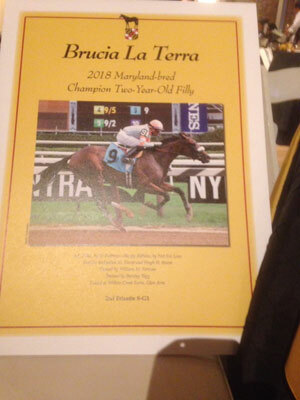 We are very proud to announce that BRUCIA LA TERRA was named Maryland-bred champion 2-year-old filly. BRUCIA LA TERRA was bred by Sallyellen M. Hurst and Hugh H. Hurst and is owned by William M. Ferrone. She won her first outing and followed that up with a 2nd in the Frizette G1. 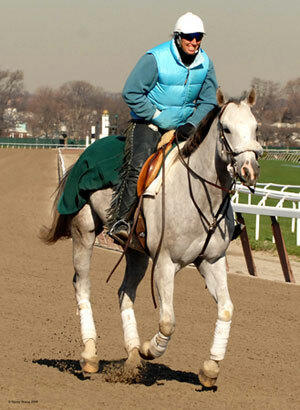 The wonderfully named LOLLI (Candy Ride (ARG)raced 6 furlongs at Aqueduct. She pressed the pace in second and then dueled to hold her spot and gradually drew away for the win by 2 lengths. The three-year-old filly is a homebred for J. Bonner Young. 2 year old NIKO'S DREAM (Central Banker) was unhurried early and then swung out into the 6 path to drive to the wire, She missed by a neck. The NY Bred filly is owned by Sackatoga Stable. Watch for her next time! Two-year-old BRUCIA LA TERRA (El Padrino) pressed the pace and the edged clear for the win by 3 3/4 widening lengths going 7 furlongs at Saratoga to break her maiden. She was selected by Barclay for owner William M. Ferrone. The $20,000 Timonium yearling purchase tore up the salty Saratoga competition! Stepping up into G1 stakes company in the Frizette, she rallied from last to nab second and added G1 black-type to her pedigree. Talk about instant return on investment. Following her across the wire was stablemate CASSIE'S DREAMER (Flatter) who overcame a bobble at the start CASSIE'S DREAMER was already G1 stakes-placed, and added more black type in the Frizette. She has proved to be a very astute claim by Barclay and has added greatly to her value as a broodmare. CASSIE'S DREAMER is owned by Turf Stable Racing (Rusty Jones) & Hayward R Pressman and was bred by Santucket Stables & Indian Creek (KY). VERVE'S TALE (Tale of Ekati) was carried wide in the Beldame G1, but got the show position to add her first G1 black-type. Recently in a blanket photo finish, she had to settle for 3rd in the Shuvee G3 at Saratoga. Last year she won the Summer Colony Stakes at Saratoga and followed that with a second in the Turnback the Alarm Handicap (Gr. 3) then third in the Go For Wand G 3.and again third in the Royal Delta (Gr.3) in 2018. Most recently she raced wide to be third again, this time in the Top Flight Invitational Stakes at Aqueduct. The Charles Fipke homebred has earned $616,400. TAGG BARN ON A ROLL: 2 winners in 2 days! 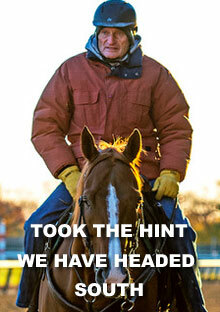 Sackatoga Stable's SPA JAZZ (Graydar) was never far off the pace and when asked. moved 3 wide to clear the field and go on to break his maiden by 4 1/4 lengths. He went off the favorite racing a mile on the dirt in a race originally scheduled to go at the same distance on the turf. The three-year-old NYBred was bred by Milfer Farm. GOLDEN VALE (Jersey Town) got the job done and broke her maiden racing 6 furlongs at Belmont. She went off the favorite and whittled down the competition to gain the lead and win by 1/2 a length. 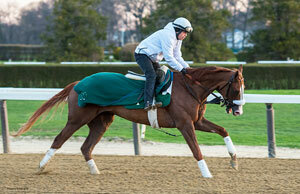 The 3-year-old filly is owned by Rookie TB Racing Stable, Inc. and Brigade Stable. It has to be interesting for Barclay to work with the offspring of Jersey Town who he campaigned to a MGSW of over $800,000. Exciting win for 3-year-old filly MOHANIE (Frost Giant) in her second-lifetime start. Off the favorite based on a strong first start, at Saratoga, the chestnut filly kept tabs on the leaders and then when cued, fanned 6 wide to challenge and clear the field. She won going away by 6 widening lengths. MOHANIE is a homebred for Henry Oak. DR. EDGAR (Lookin at Lucky) drafted along close to the leaders and then effortlessly left them behind to go on to a 5 length win in a 2X Allowance. He raced a mile on the turf and the win, his 4th, raised his earnings over $196,000. DR. EDGAR is owned by Peter and Eloise Canzone, Sr. and was bred by Frederick M. Allor & Michael T. Barnett. The 5-year-old gelding came into the Tagg barn this spring and in 3 starts, has two seconds and a win. One to Watch: Veteran trainer Barclay Tagg made two great moves when it comes to Cassies Dreamer, a 2-year-old Flatter filly. First, the trainer who is not often involved in the claiming game claimed her for $50,000 from Loooch Racing Stables and trainer Anthony Quartarolo when she made a successful debut on Aug. 3 at Saratoga. Then Tagg thought so highly of his new acquisition that he started her in the Grade 1 Spinaway. She justified the faith he showed in her for the second time when she rallied to be third with Junior Alvarado aboard. CASSIE'S DREAMER (Flatter) proved to be a very astute claim by Barclay despite the fact that the claiming game has not exactly been his "thing". Off at 68 to 1, she hit the gate at the start and was away last. Never free of the kickback, she came on gamely and closed well to gain the show position. She now has G1 black type beside her name and her value as a potential broodmare has rocketed. CASSIE'S DREAMER is owned by Turf Stable Racing (Rusty Jones) & Hayward R Pressman and was bred by Santucket Stables & Indian Creek (KY). CASSIE'S DREAMER - recent claim will contest Saturday's GI Spinaway S.
Cassies Dreamer (Flatter) was claimed by Barclay Tagg for $50,000 on behalf of Rusty Jones’s Turf Stable Racing and Hayward Pressman. The filly won that race in the Saratoga mud by 2 1/4 lengths before being haltered and headed to her new barn. 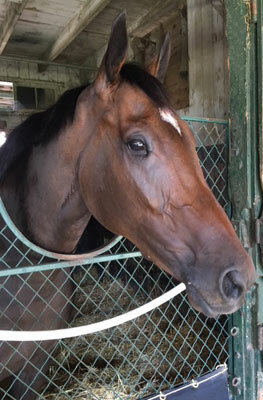 After scratching as a main-track-only entrant from Thursday’s P.G. Johnson S., the dark bay will contest Saturday’s GI Spinaway S.
DR EDGAR 2nd on DQ at Saratoga - on board in last 11 starts! DR EDGAR won in allowance company at Saratoga going 1 116 on the turf but was disqualified and placed 2nd due to a rough stretch run. DR EDGAR (Lookin at Lucky) has been on the board in his last 11 starts and has earned over $150,000, He is owned by Peter and Eloise Canzone. 2 yo BRUCIA LA TERRA wins first out! Two-year-old BRUCIA LA TERRA (El Padrino) not only won the "Saratoga Special" Name of the Day Award, she won her race as well. Starting for the first time, she pressed the pace and the edged clear for the win by 3 3/4 widening lengths going 7 furlongs at Saratoga. BRUCIA LA TERRA was selected by Barclay for owner William M. Ferrone. The $20,000 Timonium yearling purchase tore up the salty Saratoga competition! SACKATOGA STABLE purchased a Constitution colt out of G2 SW TizFiz by TizNow. We look forward greatly to getting him in the barn. He sold as hip 311 at the FASIG TIPTON New York Bred Preferred Sale. The 9th race at Saratoga, s $90,000 Allowance race at 1 3/8 on the turf, saw I'M A CAPTAIN NOW wait trailing the field until it was time to go and then swing out to inhale the field and win by 1 3/4 lengths. He is owned by Sure Thing Stables and upped his earnings to $196,750. Having found the way to the winner's circle already in the prior race, the Tagg team visited it again when multiple graded stakes-placed REALM won the 10th race, the Alydar S. He bided his time on the rail and then tipped out to surge down the stretch for the win. He has earned multiple stakes placings, but this is his first stakes win. REALM is owned by his trainer Barclay Tagg, Eric Dattner and Harry Astarita and has earned over $350,000 for his connections. In a blanket photo finish, VERVE'S TALE (Tale of Ekati) had to settle for the show position in the Shuvee G3 at Saratoga. Last year she won the Summer Colony Stakes at Saratoga and followed that with a second in the Turnback the Alarm Handicap (Gr. 3) then third in the Go For Wand G 3.and again third in the Royal Delta (Gr.3) in 2018. Most recently she raced wide to be third again, this time in the Top Flight Invitational Stakes at Aqueduct. The Charles Fipke homebred has earned $568,400. 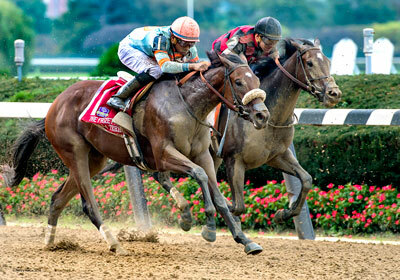 Sackatoga Stable's FROSTY GAL swung 4 wide and edged clear to capture an allowance race at on closing day at Belmont. The 4-year-old filly was stakes-placed at 3 and has been consistently on the board in her last 7 starts. She has earned over $128,000 for her connections. Multiple graded stakes placed Realm (Haynesfield cruised to a win in allowance company at Belmont. He raced just off the pace going 1 1/16 on the dirt,cleared the field when it counted and dug in for the win. Realm is owned by his trainer Barclay Tagg , Eric Dattner and Harry Astarita and has earned over $295,000 for his connections. Racing 1 3/8m on the Belmont grass, HIGHLAND SKY was dead last early, then came up into the fray on the turn. He found a clear spot late and fought to a win by 3/4 lengths. Lifetime Record: SW & GISP, 17-4-3-4, $529,222. IM THE CAPTAIN NOW (Trappe Shot) hit the board multiple times last year, but made his first 2018 start count, graduating in a MSW at Belmont going 1 1/4 on the turf. He settled behind horses and then made a wide sweeping move to gain the lead and inch clear for the win. He is owned by Sure Thing Stables LLC and was selected by Barclay out of the Fasig Tipton October Yearling Sale in 2015. He has already bankrolled $133,750 . The Charles Fipke homebred VERVE'S TALE (Tale of Ekati) won the Summer Colony Stakes at Saratoga and last year followed that with a second in the Turnback the Alarm Handicap (Gr. 3) then third in the Go For Wand G 3.and again third in the Royal Delta (Gr.3) in 2018. Most recently she raced wide to be third again, this time in the Top Flight Invitational Stakes at Aqueduct. She has earned $539,900. A winner a month ago, FERDINANDA (Giant's Causeway) learned the way to the winner's circle and won for the second time in a row with a burst of speed on the far turn to clear the field going a mile on the grass at Gulfstream. She is owned and was bred by the William M. Backer. VERVE'S TALE (Tale of Ekati) won the Summer Colony Stakes at Saratoga and followed that with a second in the Turnback the Alarm Handicap (Gr. 3) and then third in the Go For Wand G 3. The Charles Fipke homebred added to her laurels running third in the Royal Delta despite her pilot dropping his whip. She has earned over 1/2 a million dollars. The Charles Fipke homebred TALE OF SILENCE came through the field to get up for the show in the Fred W. Hooper S. G3 going a mile on the dirt on the Pegasus World Cup undercard. 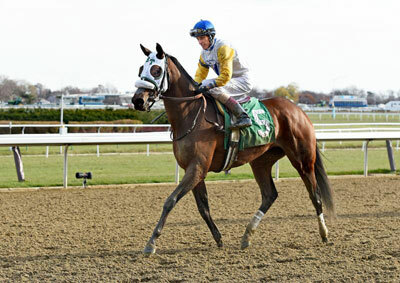 The 4-year-old colt has garnered multiple stakes placings and has earned over $250,000. FERDINANDA (Giant's Causeway) settled well and then drove clear in the stretch to break her maiden at Gulfstream in her third start She is owned and was bred by the William M. Backer. She raced a mile on the turf course. The Charles Fipke homebred RAGING TOWN (Jersey Town) took the lead out of the gate, lost it on the turn when a rival came through on the inside, but she fought back and won going away, She raced 7 furlongs on the dirt to the victory.